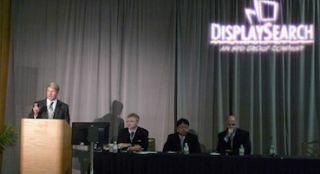 (from left to right) Dan Smith, LG; Chris Connery, DisplaySearch; Hidetoshi Himuro, DisplaySearch; and Mike Marusic, Sharp, were among the presenters at the Digital Signage Conference at InfoComm 2012 that took place June 12th in Las Vegas. On the eve of InfoComm, digital signage was front and center in Las Vegas, as DisplaySearch held its Digital Signage Conference today, in conjunction with InfoComm 2012. Crucial topics such as commercial vs consumer grade flat panels, LED vs CCFL backlit LCD, Super-Narrow Bezel (SNB), and the latest market/sales numbers brought some interesting discussion from some of the industry’s top analysts and providers. Host Chris Connery of DisplaySearch kicked off the conference on Tuesday morning with a summary of sales data from his company, focusing on the commercial arena, for large format (larger than 32 inch) flat panels. In 2011, worldwide, 2.7 million units were sold for commercial applications (i.e. the number does not include consumer grade TVs that might be used in commercial applications– “undocumented” glass, as Connery noted– a clever use a term that we’re more used to seeing in decidedly non-technology discussions). Last summer Connery predicted that there would be 3.2 million sales for 2011 when all the numbers were in. Nothing has changed in the market. The difference in numbers is due to the fact that the survey no longer includes 26 inch panels, as it did last year. That smaller size range is no longer relevant to “large screen” display. And you have to remember that Connery’s number here is not including the “undocumented” panels– and if we add some of those into the equation it is clear that flat panel sales into digital signage is up, not down. All the flat panels makers typically sell about 10X more panels into the consumer TV market than they do into officially “commercial” channels. And a good number of those “consumer grade” panels do indeed go into digital signage– especially into bars, restaurants and other lighter commercial applications. Further complicating the “commercial vs consumer panel” debate, we now have a new category: Hybrid panels. LG’s Dan Smith presented at the conference and specifically noted that LG is offering a “hybrid” LCD panel for commercial applications that is a cross between a commercial panel and a consumer TV. In fact LG has been successful in the past year with its Hybrid panel. They take a consumer panel, add RS 232 (so you can control panel from remote location); and add the ability to lock out front panel control, color calibrate panel quickly, and use built in simple digital signage software. They then add 2-3 year warranty. In fact, this “hybrid” from LG is counted in DisplaySearch’s market research numbers as a commercial grade panel (and explains a lot of LG’s jump in market share from 3 percent in 2010 to 4 percent in 2011). Market share for sales of flat panel displays in the commercial market is always an area of concern, as industry giants battle it out. In 2011, the two Korean giants Samsung, and LG, both saw significant increase in market share. Samsung jumped to 12 percent from it’s 2010 10.2 percent share. LG jumped more on a percentage basis year to year, moving from 3 percent share in 2010 to 4 percent share in 2011. The other companies in the top six: NEC, Panasonic, Sharp, and Philips– did not see dramatic changes in their market share. These numbers do not address the growth of the market as a whole, but point up the relative strength of suppliers– and it’s important to note that no one panel manufacturer dominates. Hidetoshi Himuro, Director, IT & FPD Market Research, DisplaySearch gave attendees a global perspective on trends, including a trend away from 1366 x 766 to 1920 x 1080 resolution (1080P will account for 94 percent of the commercial market by 2015– up from abut 68 percent now). Panels are becoming more touch capable. We are seeing more SNB. And new technologies such as transparent LCD, glasses-free 3D, and multitouch LCD are coming on strong. Interestingly, Himuro surmised that the fact that there is not a big 3D price premium in the TV market for glasses-free 3D is slowing growth of that technology in the commercial market. Mike Marusic, SVP at Sharp pointed out that the industry in now on a 10th generation plant. The industry generally has been on Gen 10 since 2009, and all manufacturers have lots of large “mother glass” in search of volume sales. Marusic notes that the tablet business will drive interactivity in the pro AV space– translating touch and swipe features into the digital signage market. Brands have invested lots of money in mobile apps, that are interactive, and those brands are now saying “find me a home for this content in digital signage”. Marusic also emphasized that resellers need to be more willing to cannibalize their own projector business if necessary, to make further inroads into digital signage, and that not enough resellers are going out and pitching solutions in the market. Michael Ferrer, National Manager, Solutions Sales and Operations at NEC, presented in the afternoon– not on display hardware but on how integrators can understand and win bigger pieces of the digital signage ecosystem. Acknowledging that display sales alone will never be a key to great growth in this market, for integrators, Ferrer offered a variety of tips on how to capture recurring revenue in digital signage installations, including flat panel maintenance.